The flag of the city of Minneapolis, symbolizes the interests and characteristics of the "City of Lakes". The flag of Minneapolis was designed in 1955 by Louise Sundin as part of a contest. She received a $250 U.S. Savings Bond as her prize. The Minneapolis City Council adopted it as the official flag of the city on May 27, 1955. 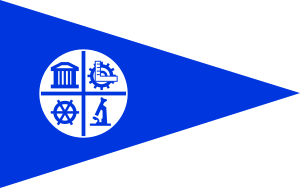 A royal blue pennant on a white field or background with a white circle on a blue pennant divided by four parts; each of the four parts of the circle containing a blue symbol, i.e., a building symbolizing education and the arts; a cogged wheel and square symbolizing labor and industry; a pilot wheel symbolizing our lakes and rivers and all activities identified with them; a microscope symbolizing research, skilled craftsmanship and progress - all of these symbols combined point out the beauty, harmony and brilliant future of our City. Flag of Minneapolis Facts for Kids. Kiddle Encyclopedia.